Few schools reported leveraging staffing strategies to improve teacher capacity for serving ELLs. 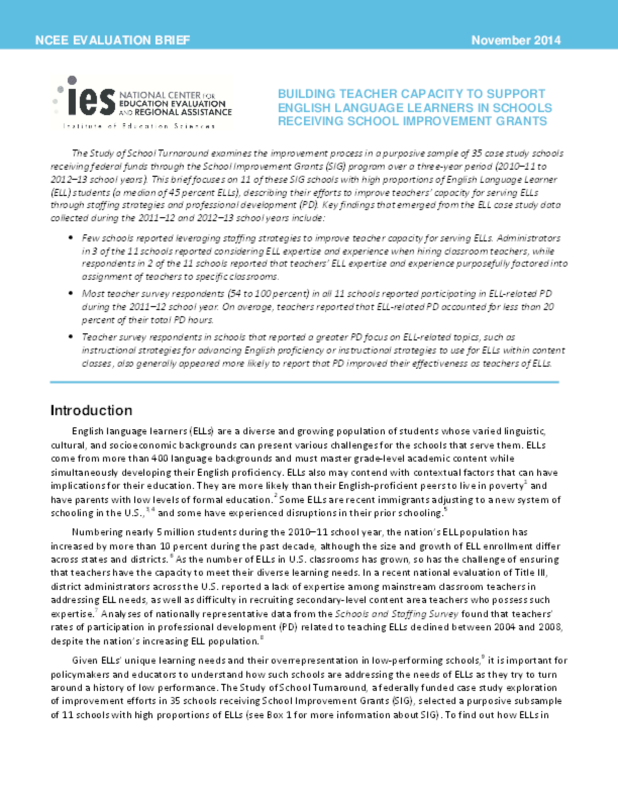 Administrators in 3 of the 11 schools reported considering ELL expertise and experience when hiring classroom teachers, while respondents in 2 of the 11 schools reported that teachers' ELL expertise and experience purposefully factored into assignment of teachers to specific classrooms. Most teacher survey respondents (54 to 100 percent) in all 11 schools reported participating in ELL-related PD during the 2011 -- 12 school year. On average, teachers reported that ELL-related PD accounted for less than 20 percent of their total PD hours. Teacher survey respondents in schools that reported a greater PD focus on ELL-related topics, such as instructional strategies for advancing English proficiency or instructional strategies to use for ELLs within content classes, also generally appeared more likely to report that PD improved their effectiveness as teachers of ELLs.